Members of the New Port Richey Parks and Recreation Youth Advisory Board, Jack McMahon, Emily Ratliff, Tanner Smith and Alex Caravona, toured the Pasco Kids First Children’s Advocacy Center while bringing donations to support other kids in need. The group generously donated $500 in snacks and Meals Ready to Eat packages and $400 in toys as one of their community outreach project. “We were thrilled to receive this donation as we often have kids who come in after school for their therapy appointments and their stomachs are rumbling. These snacks will help tie them over until dinner time and allow them to better focus during their counseling sessions.,” said Becky Bennett, Director of Development of Pasco Kids First. The Youth Advisory group participate in a variety of community services events as well as learn leadership skills such as public speaking, proper hand shakes and good eye contact. 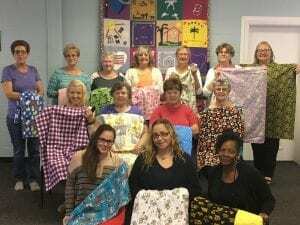 Several members of the Casa del Sol Quilter’s Group in Zephyrhills delivered a donation of 90 tummy time quilts to the Pasco Kids First Healthy Families Program in Hudson. This talented and generous group of ladies presented the beautiful quilts with a variety of children’s designs and holiday patterns. The Healthy Families workers give the donated quilts to families during home visits to teach the importance of tummy time to help their baby to build strong neck muscles. 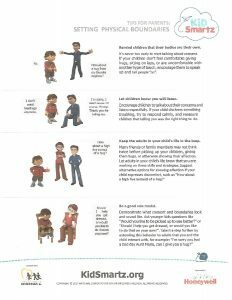 Weekly home visits include an activity with mommy, daddy, baby and worker on the floor to promote parent child interaction, bonding and brain development. Photo attached: Members of Casa del Sol Quilters with Healthy Families team members displaying tummy time quilts. The Florida Medical Clinic Foundation of Caring donated 75 new baby and toddler costumes to Pasco Kids First. The costumes will be given to families in the Healthy Families Pasco-Hernando program and to children seen at the Pasco Kids First Children’s Advocacy Center who do not have costumes this year for Halloween. The Healthy Families Program is a positive parenting home-visiting program for parents who are pregnant or have newborns who receive assistance with setting goals toward self-sufficiency. Publix Associate volunteers hold up several of the costumes including a puppy, bee, gator and panda costume. The FMC Foundation of Caring was founded in 2005 and has assisted 135 local non-profit organizations with more than $2.5 million in contributions and 60,000 volunteer hours. To learn more visit: http://fmcfoundationofcaring.org. Dade City – The Healthy Families Pasco-Hernando program of Pasco Kids First is holding a Mommies, Daddies and Me group on Wednesday, April 11th at the Dade City Women’s Club located at 37922 Palm Ave from 12pm – 2pm. Local author, Latonya Marshall will be presenting about her story as written in her book Broken for Purpose: Unmasking my Faith. Marshall is a 29 year old single mother of two sons and a daughter. She was born in Lacoochee and moved city to city to stay with her single mom and 3 brothers. She talks about the sexual abuse she endure by her father between the ages of 6 and 10 and how this impacted her decisions going forward. Marshall spent 5 years in prison on an assault charge. She will share how her faith helped her with overcoming challenges of all of the years or pain, deceit and bullying by breaking the silence. Healthy Families will provide a light lunch and children’s activity with child care. For more information and to RSVP, contact Sierra Johnson at 352-583-6236. Odessa- The Healthy Families Pasco-Hernando program will be holding their annual Graduation on Tuesday, April 10th from 6pm-8pm at Phi Delta Kappa Banquet Hall located at 11301 Phi Delt Way in Odessa. Twelve families and 14 children will be honored as Graduates of the Healthy Families program and some of their many successes will be shared as they receive their Graduate certificate. 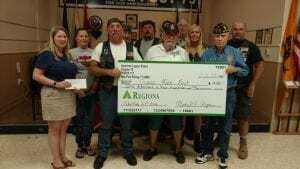 Several community partners including Gulfside Corvette Club, Publix Super Markets and the PDK Fraternity will also be recognized for their support of the Pasco Kids First organization. The Graduation is taking place as part of the monthly Mommies, Daddies and Me group. Healthy Families provides in home parenting education to new parents for 3-5 years and assist them with navigating resources to achieve goals toward self-sufficiency. The West Pasco Publix Super Market stores have chosen Pasco Kids First for their 2018 Publix Serves Day on Tuesday, April 3rd from 8am – 12pm. Sixty to one hundred Publix associates from ten stores will be working on site at the Pasco Kids First Children’s Advocacy Center and Healthy Families Hudson Office completing a variety of projects. More physical work will take place at the Healthy Families Pasco-Hernando Office located at 14120 Old Dixie Hwy in Hudson with needed carpet cleaning, window washing, pressure washing and more taking place. At both locations, Publix will have a pinwheel team where they will be creating blue pinwheel gardens to kick off April as Child Abuse Prevention Month. The national Pinwheels for Prevention campaign helps to educate communities about the importance of supporting children and families. Shining in the sun, the pinwheel is reflective of the bright future all children deserve and our belief that getting it right early is less costly than trying to fix it later. The pinwheels represent the bright future every child deserves. Last year, more than 70,000 pinwheels were planted across the state of Florida. 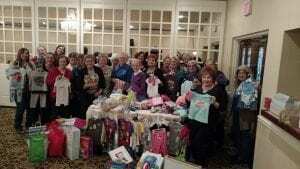 The Daughters of Penelope EROS Chapter 356 held a baby shower event at their monthly meeting at Spartan Manor. 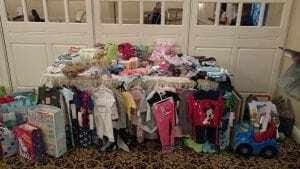 There was no specific mommy to be or baby present but the group of caring and generous women each brought in baby items such as diapers, toys and some of the most darling outfits for baby boys and girls. The gifts were presented to Becky Bennett with Pasco Kids First for their Healthy Families Pasco-Hernando program, a positive-parenting home visiting program for expecting families or those with newborns. In addition, the ladies donated journals, toiletry items, undergarments and more for the kids served at the Pasco Kids First Children’s Advocacy Center. The Daughters of Penelope formed 37 years ago and support a variety of charities throughout the year. Georgia Theatre Company is a fourth-generation, family-owned business specializing in movie theater exhibition. The company, headquartered on St. Simons Island, Ga., is one of the 20 largest theater circuits in the United States. Georgia Theatre Company operates 254 auditoriums at 24 locations in Georgia, Florida, South Carolina and Virginia.